When most stars look to their future, they see a white dwarf. These stellar remnants are hot, dense, and littered throughout the Galaxy; they pack the mass of a Sun into something the size of Earth; yet for all their extremes, white dwarfs appear faint and generally behave predictably. They sit there and slowly cool for eons. Maybe we just weren’t looking hard enough. 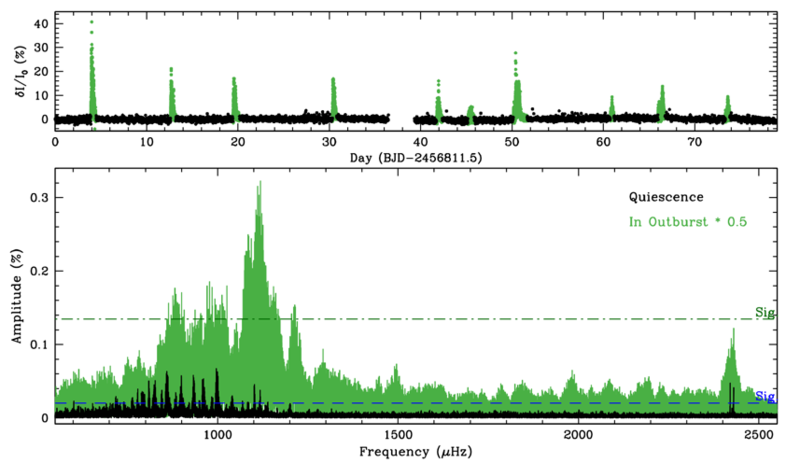 The authors of today’s paper used the extended Kepler mission (K2) to stare at one of the brightest hydrogen-atmosphere variable white dwarfs, PG 1149+057, for about 80 days. They expected to find small changes in brightness due to buoyancy waves inside the star that they could study with asteroseismology. K2 revealed that PG 1149+057 does pulsate as expected… but it also experiences very bright outbursts! The top panel of the figure below shows brightness as a function of time, with outbursts colored green. The bottom panel shows how the pulsation spectrum differs when an outburst is occurring (green) or not (black). This pulsating white dwarf has outbursts! Top: brightness vs. time (light curve) from K2. Bottom: spectrum of pulsation frequencies, from a Fourier transform of the light curve. In both panels, green points are during outburst and black points are during periods between outbursts. Figure 2 from the paper. Before getting too excited, it is important to verify an unexpected discovery like this by asking key questions: Is there any precedent for an object to behave this way? Is it physically realistic? Could the outbursts be due to some other contaminating source, or are they definitely coming from the white dwarf? 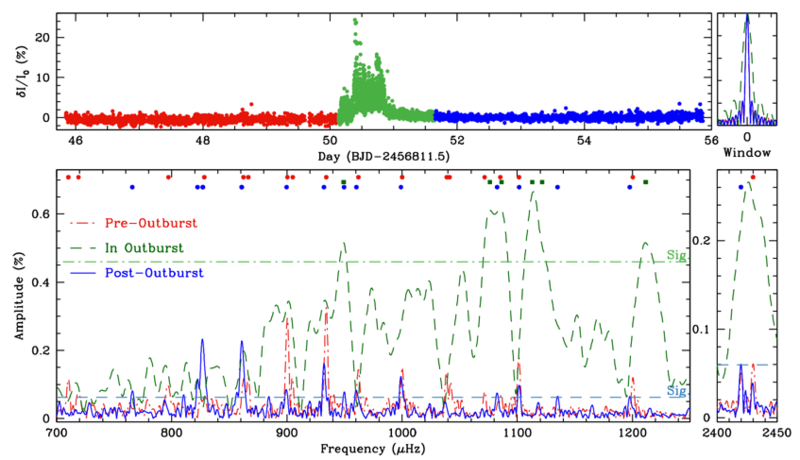 PG 1149+057 is the second pulsating white dwarf to show outbursts. The first was discovered during the original Kepler mission, and is very similar in composition and temperature. This is good news, because without a second example of some strange new phenomenon, an observer can never be sure if they have found a weird fluke or made a real discovery. Next, the authors verify that the outbursts can’t be coming from something else (like instrumental noise, a background star, or even a foreground solar system object). The fact that pulsations are stronger during outbursts supports this, because if they were coming from another bright object that only occasionally appeared, the white dwarf pulsations would look relatively weaker during outburst due to more total light. Finally, the authors examine how the outbursts affect the pulsations in a little more detail. The figure below zooms into a single outburst event, and examines the pulsation spectrum before, during, and after that outburst. Pulsation amplitudes immediately after the outburst are lower than those before the outburst. This hints at some kind of critical avalanche-like process: the energy of a pulsation mode grows until it reaches some threshold, rapidly transfers energy to several other resonant modes, and those modes are then quickly damped by convective turbulence. Zoomed view of a single outburst, which is color-coded by observations before, during, and after the outburst. Top: brightness vs. time. Bottom: spectrum of pulsation frequencies from a Fourier transform. Colored dots indicate individual pulsation modes that exceed a significance threshold. Figure 4 from the paper. While the authors leave a more detailed analysis for future work, there is no doubt this is an exciting discovery. Future K2 observations will likely find more of these objects now that we know to look for them. Compelling questions abound: why do other well-studied white dwarfs not show outbursts? What physical mechanism triggers an outburst? Do outbursts eventually suppress pulsations altogether as white dwarfs cool? Stay tuned, and in the meantime, let’s keep pointing telescopes at new things.